5.3 earthquake hits eastern Turkey. 5.1 earthquake hits the Volcano Islands off Japan. 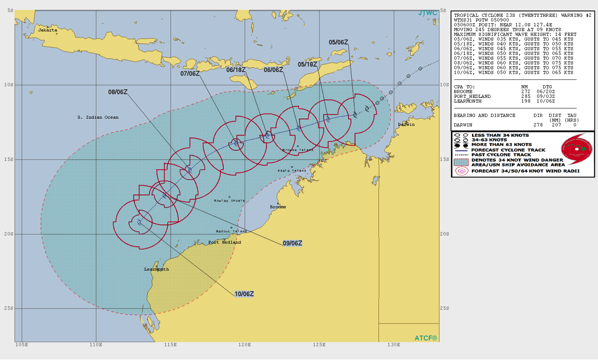 In the Southern Hemisphere: Tropical cyclone (tc) 23s (Twenty-three), located approximately 207 nm west of Darwin, Australia, is tracking west-southwestward at 09 knots. Thailand – Pattaya city was hit by flash floods for the second consecutive day on Wednesday after being pounded by thunderstorms. Several areas were flooded up to a meter high and roads cut off after the touristic coastal city suddenly experienced torrential rain in the afternoon for over two hours. The city yesterday also saw vast areas submerged by floods following hours of heavy rain, damaging many homes and a popular beach. Many parts of the major road Pattaya Tai were inundated, causing traffic jams several kilometers long.